Thinking about going to China Gate for dim sum anytime soon? Think again. That Chinatown International District landmark is presently closed. Had you shown up this week, as I did, you might have seen an unwelcome sight. The once bustling restaurant — in its day considered Seattle’s top spot for dim sum — with its doors bound in chains. 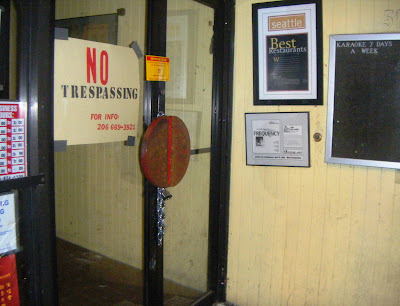 The not-so-welcoming doorway at China Gate, 516 Seventh Avenue South, Seattle. When last I mentioned China Gate, it was to tell you about the reappearance of its longtime owners Sonny and Macky Wong, who ran the place for 20 years before selling it in 2008 to Kwok Jing Woo. The Wongs are now doing business at Macky’s Dim Sum in Issaquah. 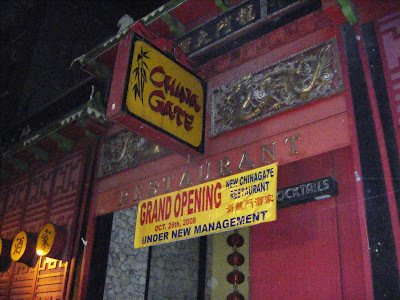 Mr. Woo’s “Grand Opening” sign — touting new management as of October 2008 — still hangs on the closed restaurant’s ornate facade today. Grand opening under new management in 2008. Not so grand closure this month. It’s been lights out, Gate closed, since March 3, says property manager Fay Hong, who represents landlord Yick Kong Corporation. “I’m really sorry I had to evict him,” says Hong of the short-term owner. Yick Kong also owns the property housing nearby Honey Court. When Woo bought China Gate, he was doing a good business, Hong says. “He had good intentions” as well years of experience as a restaurateur, having been the longtime owner of a Chinese restaurant prior to taking on China Gate. But running a big dim sum restaurant in Chinatown is not only different, it’s difficult, Hong says. Between the recession, the competition and an expensive lease, the owner of China Gate was unable to keep up with expenses, Hong explained, and court records indicate Woo was several months in arrears on rent when the landlord filed suit prior to eviction, then locked the doors. Woo was unable to be reached for comment. Hong, president of the Seattle chapter of the Chinese family association Hop Sing Tong, is intimately aware of what it takes to run a Chinatown restaurant. Half a century ago, his parents owned the Chinatown restaurant Atlas (now Ga Ga Loc), and he and his family later opened the 500-seat House of Hong, another Chinatown landmark. In 1993, Hong sold his eponymous restaurant to Po Lee, who ran House of Hong for eight years before selling it himself (Lee still owns the property). Last week, the My Wallingford Web site reported that Lee plans to open a 100-seat Chinese restaurant, Bamboo Village, at 4900 Stone Way. In addition to Cantonese and Mandarin dishes, Bamboo Garden will specialize in dim sum. 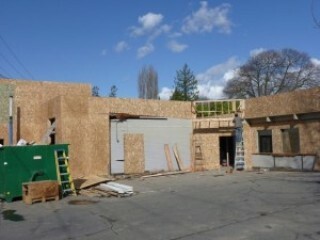 Bamboo Village, expected to open late this spring, now under construction in Wallingford. As Lee prepares to bring dim sum to Wallingford, Hong today posted a “for lease” sign at China Gate. “I don’t think we’ll have to wait very long,” to find someone to move in and carry on, Hong says. He’s already heard from interested parties, and given the economy, he expects to lower the rent to make taking on the lease more attractive to potential buyers. His hopes for a sale aside, business has been slow all over the ID, Hong says. The recession is part of that, but there’s another problem dogging local business-owners. “People are kind of afraid to come down here,” he insists. Among the restaurants that call the Chinatown International District home, “Less than a handful, maybe five of them, are making money. 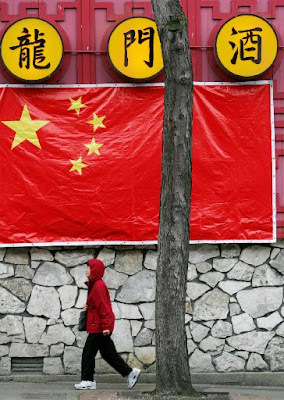 The other 40 or so are breaking even, or losing money.” Hong blames it on the economy. Other business-folk place the blame on the area’s transient population and excessive panhandling, he says. Yet Hong remains hopeful that the recession will soon come to an end, signaling an uptick in business. As for the transients and panhandlers taking up residence in his beloved Chinatown, “We had a walking tour with the mayor last week,” and fingers are crossed that the city will take steps to help keep the district clean, safe and welcoming for those of us who eat, shop, live and work there. A woman walks by China Gate in the Chinatown International District.